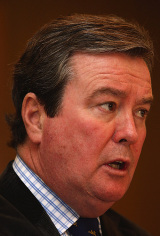 John O'Neill is the controversial CEO of the Australian Rugby Union. An often outspoken and flamboyant figure, O'Neill has often been vocal with his criticisms of those within the ARU and abroad. O'Neill first held the position of chief executive with the ARU between 1995 and 2003, during which time he presided over a World Cup victory, two Tri Nations victories, five consecutive Bledisloe Cup successes and the Australian hosting of the 2003 World Cup. Having led the Wallabies into the world of professionalism, O'Neill's greatest success proved to be the successful hosting of the 2003 World Cup. Following the final of the competition, and despite the Australian side losing to England, the Wallaby coffers were swelled by up to $45m. This was a marked difference to the state of affairs O'Neill inherited in 1995, with the ARU operating at a loss for several years previously. Following the end of the 2003 World Cup O'Neill left his position with the ARU and took another, with the Football Federation of Australia. O'Neill's success continued, with "soccer" becoming increasingly more successful over time. Gates for the new 8 team A-League increased from around 4000 to 10000 under his stewardship and the final of the competition was a sell out at Aussie Stadium. O'Neill was instrumental in securing the services of Guus Hiddink as coach for the Australian national side during the 2006 World Cup, which they exited at the round of 16 for their best ever result at a finals. Following the World Cup, O'Neill ended his contract with the FFA early. He returned to his former post with the ARU in June 2007, in time for the 2007 Rugby World Cup. O'Neill's statements have been linked in several cases to his desire to improve the standing of rugby union in Australia, as it currently stand fourth in the country's affections behind Aussie Rules, Cricket and Rugby League. In 2012, he was appointed to the board of Rugby World Cup Ltd, the body charged with delivering the game's showpiece event.